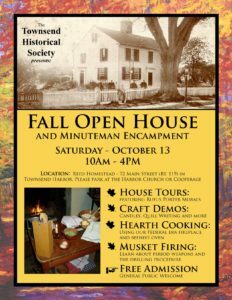 The Townsend Historical Society announces a Fall Open House and Minutemen Encampment on Saturday, October 13, 2018, from 10 AM to 4 PM. Location will be at the Reed Homestead, 72 Main St. (Rte. 119), Townsend Harbor, MA. Please park at the Harbor Church or Cooperage. Craft Demos: Candles, Quill writing, and more. Hearth Cooking: Using our Federal era fireplace and beehive oven. Musket Firing: Learn about period weapons and the drilling procedure. Free Admission! General public welcome.